Its Saturday, its raining, Hubby is watching the F1, so where am I, of course, in the kitchen, where else would I be on a day like today! I decided I needed to bake a little treat to have with a cup of tea when we finally congregate as a family at some point during the day, only Olly is at home, but he has been away for a couple of days, so there will be loads to catch up on. 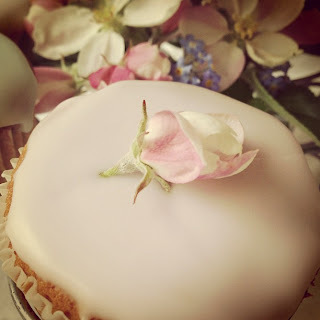 I decided to bake these gorgeous spiced fairy cakes from ‘Love Bake Nourish’ by Amber Rose, as it is my favourite book at the moment and I am currently on my third bake from it. What I like is, not just that the recipes use such interesting ingredients, but so far, every bake has come out perfectly. This to me is always a sign of a very good cookery book, one that has had the recipes tried and tested. As usual I didn’t have all the ingredients at hand and I certainly did not want to venture out, so I adapted here and there like any good baker does and Hubby was rather pleased as he really would not of enjoyed the cream cheese frosting that these little cakes should of been topped with, but he totally loved my simple lemon water icing. Next time I will have to make them with the cream cheese frosting as I would just love it and it would truly compliment the flavour of the cakes. So all baked and now photographed (they call me the food paparazzi around here), I decided to have a little play with the photographs. 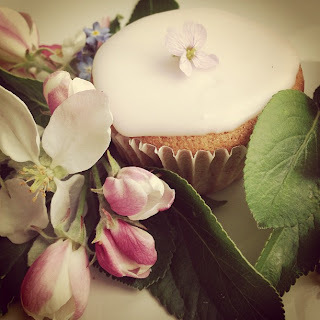 I have decided as I approach the 3rd birthday of the blog that it is time for a new look, I want a softer vintage feel. I hope you like it! Note : I didn’t have the ingredients for the cream cheese frosting, so I just made a simple lemon water icing and delicately coloured it using gel colours in pink, blue & violet. Line a fairy cake tray with paper cases. Mix the dry ingredients together into a bowl. Cream the butter until very pale and fluffy, add a heaped tablespoon of the flour mix and whisk to incorporate. Add an egg and whisk, then add another heaped 1 to 2 tablespoons of the flour mix and whisk again before adding the final egg. Continue to whisk until you have a light and fluffy mixture, if it starts to curdle, just add another tablespoon of flour. Add the rest of the dry ingredients, the maple syrup, orange/lemon zest and raisins. Gently fold everything together until thoroughly combined, adding a little milk at the end if needed, just enough to bring the mixture to a soft dropping consistency. Spoon the mixture into the prepared cases and bake for 15 to 20 minutes. They are cooked when they spring back to the touch and are nice and golden, remove from the oven and allow to cool on a wire rack. To make the frosting, mix the cream cheese, lemon zest and maple syrup/honey until smooth and creamy, add a little lemon juice at the end. Spoon the frosting onto the cooled cakes and spread with a small palette knife. Decorate with the flowers. If you prefer a neater finish, you can always pipe the frosting on, however, they do look rather pretty done in the more rustic way.